Did you know that when I reached 57, I became worried about the years turning me into a big soft gummy bear? I might have pulled off 'cute' but I would not have been happy nor would I have respected myself. Instead, I reached out to Karel. Thanks for your consistent encouragement and inspiring energy! You cheer me on as I reach and exceed new goals. Every session is new and challenging. Every large and tiny muscle is now alive and well. Every hour with you has been the very best investment in ME! Not quite as young as we used to be, we were looking for a personal trainer who could challenge us while at the same time, understanding the limitations of an older body. We both have been working with Karel for several months and she has been wonderful. She is always positive, energetic and motivating. 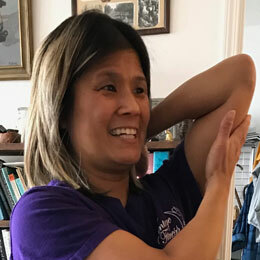 She ensures every exercise is executed in the correct body position and alignment; she adjusts and modifies immediately if our arthritis starts to flare up; she follows up every exercise session with an email to ensure there are no post-workout issues. Our flexibility, range of motion, and core strength has improved greatly. With Karel’s knowledge and experience, we have been very pleased and would highly recommend her! Karel is a fitness enthusiast and loves motivating the Older Adult Population on their fitness journey! She is a certified Older Adult Specialist, Personal Trainer, Group Fitness Instructor, Bonefit Trained through Osteoporosis Canada and a Healthy Eating and Wellness Coach. Specialities include teaching Older Adult Arthritis, Parkinson and Muscle Conditioning group fitness classes. She is an active volunteer, working with Stroke recovery groups and has previous Personal Support Worker experience in various Seniors homes. She therefore recognizes the importance for Older Adults to maintain their flexibility, strength, balance and mobility to remain at home for as long as possible. That combined with healthy food choices can help to promote longevity, ease medical conditions and achieve weight loss goals. Her second passion is travel. Living abroad for 20 years has given her the unique opportunity to experience cultural immersion in The UK, Gabon, Oman, Russia and The Netherlands. She brings energy, a positive attitude, patience and a cheerful smile to every session.